“He has the gift of gab. He’ll make a good sales person.” It’s been a while since I last heard that expression. The idea is, of course, that sales people are good talkers. If you are a good talker, you are well on your way to having the necessary qualifications for a sales career. While that figure of speech isn’t popular today, the idea behind it continues to have currency. That idea is, like so many other pearls of conventional wisdom, completely and utterly wrong. Good sales people are not good talkers. Rather, they are good listeners, good thinkers, and hard workers. Good talkers generally make mediocre sales people. They commonly delude themselves about their effectiveness, and see their sales calls and customer relationships through a distorted perspective. Since ‘talking a lot’ is one of their core personality traits, it makes them feel good when they exercise that trait. Since they feel good, they think the customer must feel the same way, and therefore, it was a successful sales call. I once made a joint sales call with a sales person who spent two hours talking about a range of subjects. When he finally left, he hadn’t gotten to the subject of the sales call. In debriefing after the call, he actually felt good about the call, which was, by any measure, a disaster. Good talkers often see themselves as the repository for product knowledge, and believe that their job is to disseminate as much product knowledge in the sales call as possible. I had the ultimate example of this in one of my sales classes. We were role playing “presenting” a product – what should have been at most a ten minute exchange. This classic “good talker” turned it into a 35 minute monologue, which ended when I mercifully intervened and called time. The person playing the role of the customer had actually begun to nod off. The “sales person” saw himself as a product knowledge expert and good talker. And so, he lived up to that vision of himself. I, on the other hand, saw him as a disaster. In my evaluation after the class, I asked my client to consider whether he belonged in a sales position. Unfortunately, the large quantity of customer contact that comes with the job of the sales person is an attractive source of ears, and leads a lot of “good talkers” to a career in sales. So, they have a tendency to gravitate to sales careers, where they have lots of opportunities to exercise their personality trait and talk to a lot of people about a lot of things. Alas, that doesn’t have a lot to do with what makes a sale happen or the processes and skills required to become good at the job. Good sales people, on the other hand, are better listeners than talkers. They instinctively understand that the customer feels better when he/she is able to share with them what’s on his mind. In the communication process, the customer’s conversation is far more valuable than the sales person’s, and the best sales calls are characterized by 75 percent of the conversation coming from the customer and 25 percent from the sales person. Good sales people understand that the essence of the job is to provide the customer what the customer wants, and the necessary prerequisite is to discover what the customer wants in depth and detail. In this process, you can never discover what the customer wants when you are talking. That only happens when you are listening. That’s why “good sales people are good talkers” is one of those ideas that have a debilitating effect on sales people and sales teams. 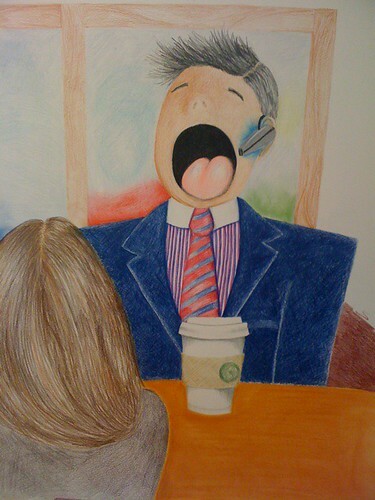 Image “The Talker” by Jennifer Mathis on Flickr under Creative Commons license.